Inside an internationally-inspired Brooklyn home exploding with texture and color. When most couples say they want to build a home together, it’s typically strictly a figure of speech. Sybil Domond and Dan Lessin, the husband-wife duo behind the buy-sell-trade lifestyle brand, People of 2Morrow, are an exception to that rule. For the past decade, the Brooklyn-based power couple has been cultivating their most creative project yet: Their Greenpoint townhome. 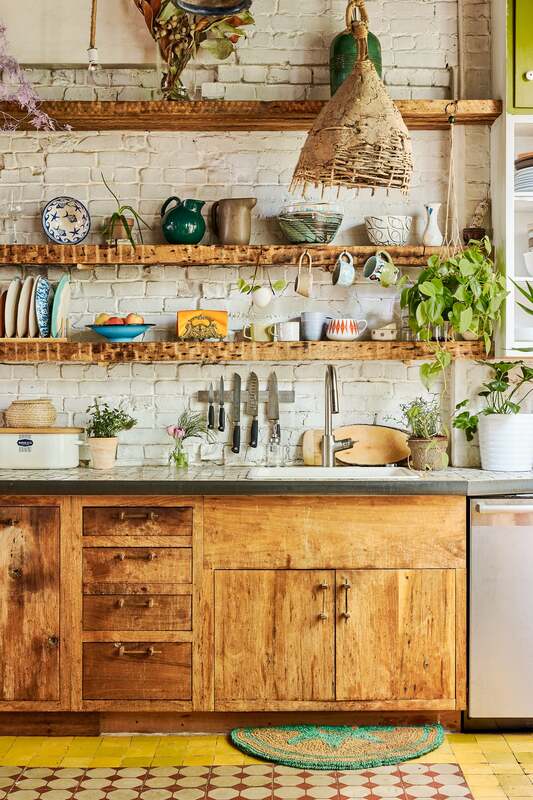 Masked by colorful concrete walls, 100-year-old French cement tiles, and salvaged wood, their Brooklyn home exists somewhere between a Caribbean-cool treehouse and a Mediterranean surf shack. Floor by floor, the pair has spent the better part of the past ten years renovating each of the home’s three separate units. While Domond and Lessin have called all of the apartments home at some point or another, the duo’s current home can be found on the third floor. Soaring ceilings and a separate mezzanine, which now doubles as a bedroom for their eight-year-old daughter, made this final stay the perfect retreat for their family of three. If Domond and Lessin’s walls could talk, they’d tell you everything you’d need to know. A tactile portrait of the blood, sweat, and hours that went into their renovation, each perfectly imperfect surface is a testament to their passion for travel and textured spaces. With the help of a few construction-savvy friends, Lessin took a hands-on approach with the renovation. Blowing out walls, re-supporting the building with 18-foot beams, installing handmade mahogany windows, and adding French drains to the kitchens and bathrooms were just the beginning. Staying true to their longtime love for salvaged artifacts and upcycled materials, every surface tells a different story. In the kitchen alone, a wild mingling of materials invites new life. Can you name another home where raw walnut wood sourced from the Bronx and century-old French cement tiles peacefully coexist? While her penchant for textiles and prints stems largely from her background in fashion (Domond used to run import production for companies like Target and Betsey Johnson), her fascination for color harkens back to her bold upbringing. “My parents are from Haiti and everything was always so bright and colorful. In my grandmother’s house, every room had a different color. It could be a little crazy at times but, nevertheless, there was a beauty in making each space its own. I’ve tried to embrace that aesthetic,” she shares. Along with the round walnut kitchen table (a quirky steal Lessin found on Craigslist), the imported Moroccan tiles are one of the couple’s favorite additions. Even if you took out all their furniture and decorative belongings, it’d be difficult to not feel instantly transported. “They bring such a beautiful feeling to the space. They’re all handmade and you just feel the texture of them. You don’t feel like you’re in New York or in the U.S. at all. You feel like you’re in another world,” says Lessin. Between the exposed joists and 10 foot high ceilings, the master bedroom feels more like a tropical treehouse than a stuffy place to snooze at night. Filled with art and treasures sourced from flea markets near and far, to say that their textured slice of paradise is personal would be an understatement. As a dedicated thrifter and self-professed collector of objects and artifacts, hunting for hidden gems comes second nature to Domond. Aesthetic aside, as a seasoned New Yorker, Domond knows that practicality always comes first. Still, it’s the unexpected moments—the things you know only come around once in a lifetime—that give a home its flavor; it’s je ne sais quoi. For Domond, that piece is a photograph her close friend, Adriano Fagundes, took on a trip to the Brazilian Amazon. While Domond and Lessin have come along way from barbecuing on their fire escape (yes, they did that) and dedicating 16 straight hours to one cement wall, those memories and that same creative ambition continue to inform their next projects.